Most of us are familiar with Hieronymus Bosch’s brilliant, imaginative work, yet thanks to all the record-destroying during the reformation, we know little about Hieronymus Bosch the man. Nor do we know much about his looks, apart from this portrait. 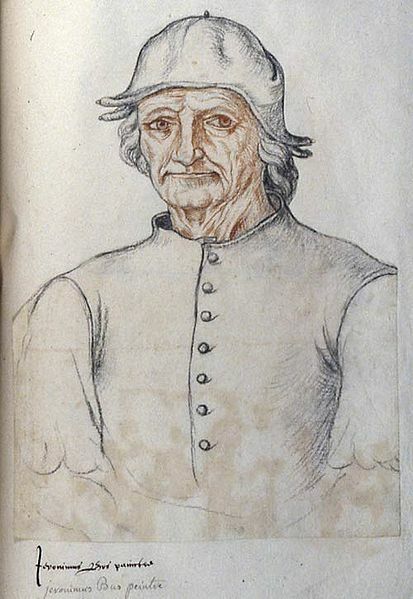 Hieronymus Bosch as an older man. Portrait attributed to Jacques Le Boucq. His eyes, which are the deep midnight blue of a newborn baby, have a haunted look about them. He’s wearing an ink-and paint-smeared smock and, with his wild hair, he looks as if he’s had an unfortunate encounter with a lightning bolt. In The Infidel’s Garden, I’ve depicted Bosch as an eccentric, independent thinker and subtle subversive – a man of few words who expressed his opinions through his work. What we do know about him is that he was born as Jeroen or Jerome van Aken in 1450 into an artistic family. His grandfather and four of his uncles were painters. Around 1480, he married Aleyt Goyaerts van den Meervennes ( spelling also differs according to source),who may or may not have been older than him. They had no children. His main place of work is also debated, with some sources suggesting he lived nearby town of Oirschot, and others that he maintained a studio in the heart of Hertogenbosch. 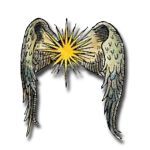 Aleyt came from a family of pharmacists which may explain the presence of the exotic glassware and visual references to the processes of distillation and evaporation in The Garden of Earthly Delights. In The Infidel’s Garden, Aleyt and her mother work at the family apothecary. Although there’s no evidence to confirm this, we do know her family profession and wealth enabled Hieronymus to continue painting. Of course, Aleyt isn’t mentioned much in the references to Hieronymous Bosch, but I like to think she was the grounded woman I’ve depicted in The Infidel’s Garden – a foil and support for her eccentric and distracted husband.